"Many needlework pieces, whether they are simple embroideries or sophisticated samplers, are made by women of all ages and levels of training. Where they were made, composition and who made them all contribute to the value. If there is a piece of needlework you are looking for and do not see, please call or email, we may not have cataloged it yet." 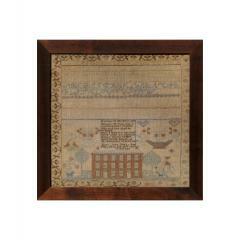 This a wonderful needlework sampler featuring a unique design. The center of the sampler features a bold tombstone type design with wonderful floral accents surrounding the central feature.Adeline Bradley was a direct descendant of John and Priscilla Alden of Mayflower Fame. Adeline's mother was born on Nantucket Island and her father in Marcellus, New York. 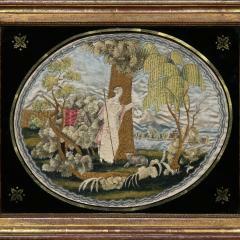 A very well composed needlework sampler by Eleanor Myers. This sampler features a beautiful flower basket in the center flanked by smaller baskets and other Pennsylvania Dutch motifs. 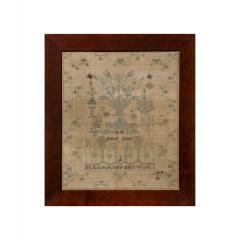 This traditional sampler has maintained its beautiful color and design throughout the years. 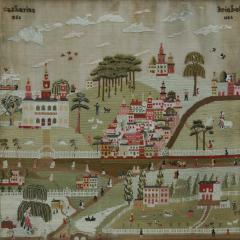 An intricate composition with a floral border displays adjoining homes in red with flanking trees, animals, flowers and plants. The upper half of the sampler shows both numerals and letters in sequence. Made by Mary Jane Scott in the twelfth year of her age. A very nice composition of a woman figure tending sheep upon a landscape. 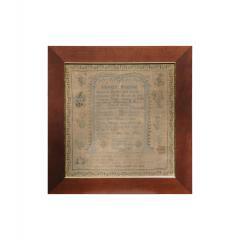 There is an eglomise border within in the frame displaying a gold leaf and berry spandrels.